The story about Sir Humphrey reminded me of a poem by T.S. Eliot in his book "Old Possum's Book of Practical Cats" - the basis of the musical "Cats". 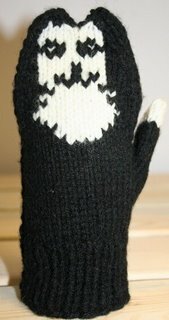 In fact I had had this particular cat in mind when I designed one of my cat mittens. Here is the first verse of the poem and the mitten. In fact, he's remarkably fat. For he's the St. James's Street Cat! Or such an impeccable back. By Bustopher Jones in white spats! Not quite the same cat, though both were Jellicles. The location, I believe, is the same as that cruised by Sir Humphrey - St James. Also in the book by T.S. Eliot is a wonderful poem about Jellicle cats - "The Song of the Jellicles" It's really worth a read! Also if you wanted to know more about the origin of the name "jellicle" and the funnier side of T.S. Eliot, here is a clip from a British paper written in 2002. On the left is the sock version of a jellicle, the face is on the top side of the foot of the sock, so the cat "looks" at you, when you put your feet up. The sock is knit back and forth on two needles to make it easier to knit the face details. Enough of mittens, though, and heavy socks. 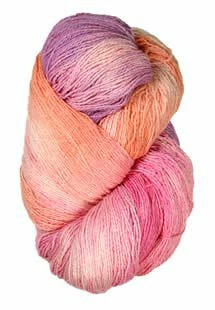 It's Spring and the temperature is rising so I had to show you a new colour of Fiddlesticks Knitting Country Silk - Cream Soda, created especially for warm weather knitting. A whisper of a shawl in this colour maybe all that's needed at a garden party or summer wedding. Save the world with a crochet hook?